The course will introduce Quantum Field Theory (QFT) by bringing together concepts from classical Lagrangian and Hamiltonian mechanics, quantum mechanics and special relativity. We will also introduce string theory, both as a simple two-dimensional QFT and as a way to go beyond QFT concepts. The course will begin with a reminder of classical field theory concepts. 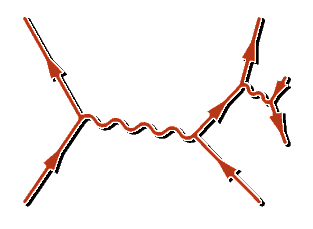 We then go on to a discussion of free and interacting quantum field theories in the operator formalism, explain Feynman diagrams and the computation of scattering amplitudes. In the second term, we begin with an explanation of path integrals, both in quantum mechanics and quantum field theory. String theory follows next, and we will discuss its spectrum, symmetries and duality symmetries. The last part of the course is about scale dependence and renormalisation. Artu Rajantie's Advanced Quantum Field Theory at Imperial College. David Tong's Lectures on Quantum Field Theory at Cambridge. Michael Luke's Quantum Field Theory lecture notes at Toronto. Sidney Coleman's '75-'76 Harvard lectures as nostalgic black and white video recordings.